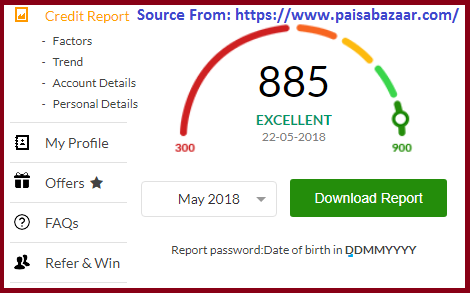 Online Procedure for checking Free Cibil Score / Credit Score Report using Pan Card Number in paisabazaar.com or www.cibil.com…. Borrowing any type of loan from a financial lending institution can be quite easy if a person has a good credit report. The credit history is first looked at before a lending institution can trust you with their money. It is for this reason that the CIBIL Score or Credit Score was introduced to help creditors. CIBIL Score is basically a three digit number that ranges from 300 to 900 used in determining whether or not someone is eligible for a loan. The Credit Score Report is usually obtained based on a person’s credit report that is made up of all the loans and financial transactions that were made initially. People that have a higher Credit Score can easily get access to loans as compared to those who have a lower CIBIL Score. The credit bureau will check all the loans that you currently have before giving you a CIBIL Score and credit utilization. Credit exposure makes up 25% of the total CIBIL Score. When calculating a CIBIL Score, the credit history is the most looked at information as it showcases how you have paid any previous loans borrowed. This information makes up 30% of the CIBIL calculation. The duration of all loans borrowed together with a credit portfolio is also used when calculating your CIBIL Score. This information makes up 25% of the total CIBIL Score. Other things that are also put into consideration when it comes to calculating your CIBIL Score include the previous credit behavior and credit utilization which make up 20% of your CIBIL Score. Getting a loan within the shortest time possible. Maintaining a High Credit Score / CIBIL Score is very important since it will help you get financial help without having to strain. You can easily get your Cibil Score Report / Credit Score Report using your PAN Card number without having to spend a single cent. The only requirements needed is a faster internet connection that will make it easier for you to open the online portal. On your browser, enter https://paisabazaar.comas the official link to India’s best Loans and Cards Market place. Once in the portal, click on “Free Credit Report” button from the option displayed in this portal’s homepage. You will automatically be redirected to a different page on the site from where you should correctly fill in all the information required. Some of the details required include gender, Full Name, PAN card number, date of birth, email address and mobile number. Confirm your request by accepting the conditions given. This is done by clicking on the small box that is displayed immediately after the details. Click on “Get Free Report” to complete the process. You can check and download the Free CIBIL Score from the Email that you entered. You can only login into the CIBIL account if you have successfully registered with the system. Registration is done on the CIBIL Website for all Indian Citizens or Permanent Residents who are currently working. One must have a valid email address, PAN Card number and mobile number before being allowed to register on the portal. There are also some payments that need to be made for you to get a Username and Password that will be used when logging into the website. On your browser, enter https://www.cibil.com as the link to the official CIBIL Website page. After the page has successfully opened, click on “Member Login” Option. This option can be clearly seen from the top right corner of this portal. You will automatically be redirected to a new page on the site from where you should enter your username that was generated when registering. Enter your password in the space set aside for this information. Finally, click on “Enter” button to log into CIBIL. Successfully applying and getting a bank loan can sometimes be difficult especially if you have a low CibilScore. For the banks to trust you with their money, one must have proven that they can easily repay the borrowed amount without being forced. You must also explain how you are going to use the loaned amount before they can finally agree to give you the loan. Each bank or lending institution has its own minimum CIBIL Score that they look at before giving a loan to an individual or company. However, most banks prefer a CIBIL Score of 750 and above before deciding to give you a loan. Furthermore, if you have a high Credit Score, there is a great possibility of getting the loan with low interest rates. One can easily achieve a high CIBIL Score by returning the borrowed amount earlier or within the specified time frame. Late payments will affect your Credit score since banks and other creditors will not trust you with their money. Strive to maintain a higher CIBIL Score if you wish to apply for a big loan from a bank or any other financial institution.